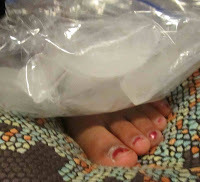 Robyn came home from school with a very, very badly stubbed toe. All was wrong in her little world. She couldn’t walk, talk, laugh, at least not until something fun was going on and she forgot about it. I have to admit it was quite swollen and I could tell it hurt to move. Once our resident expert got home from work, everyone got into the action. The suggestions ranged from cutting it off, buying a new one, to taping it to the next toe. When we finally called the trainer, since she has a meet this weekend and we were a little worried it was broken, the solution was to ice it for 15 mins every hour. She was a little suspicious about this form of treatment, but warmed up to it after seeing her throne. Charles had her set up with a blanket, pillows under her feet, and a movie.....that’s when she asked for popcorn. It was amazing how quickly she jumped up from her throne when she got a phone call. Upon the second stubbing as she ran up the stairs that same night, the crying was doubled. A few seconds later, Robyn’s crying modulated to yelling/crying when attention wasn’t received quickly enough. Then Finley started crying because now her toe hurt, and she wanted to get around Robyn who was dramatically sprawled across the stairs. I don’t know, all I know was we were in a world of hurt.